We are a small and friendly club which has a variety of members with very varied skills. Many of our members travel considerable distances to meet with us and most are very active turners. We promote our club and woodturning at various events during the year. Members can offer advice and tips and you can learn a lot from our demonstration evening, which showcase some of the top demonstrators available as well as our own members’ talents. We use a media projector to make sure that the action is viewed from several camera angles. There is always a table for display of your latest creation at each meeting, also the occasional item turns up for sale. As part of your membership we can offer you a free personal gallery page on this website. We also have a number of nights where traders may show their wares and demonstrate their products. We hold a club competition annually where we award the Club’s “Malcolm Fox Memorial Trophy” to the entry voted most popular by the members. See the calendar page for all this years events. 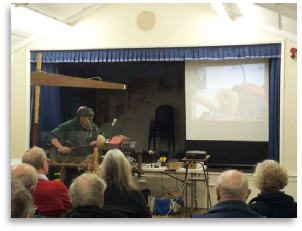 A well-attended multiturn evening, where members bought along their lathes for fellow members to have a go at using and gain ideas from the more experienced. The challenge this year was to turn a platter, which could be left plain or decorated to your taste. The choice was left up to the entrant. On the night we received thirteen entries for the competition and the efforts can all be seen in the photos below. First place went to Peter Thurston, there was a tie for second place between John Abercrombie and Ian Cameron. Fourth place went to Mike Charnley. All day demonstration. 27 October 2018 - Mark Sanger. Mark introduced himself as a retired policeman, with an engineering background, from Devon who decided to do wood for fun! He went on to explain that in truth you only need 7 tools including 2 scrapers which after some practice and experience can be dispensed with as you become more proficient with the other tools. The tools were Spindle roughing gouge, spindle gouge, bowl gouge, parting tool, skew and the 2 scrapers (round and square end). Mark then emphasised safety by highlighting the many danger that are present in the workshop, concluding his introduction with the fact that he now always wears a full facemask, in his workshop it’s a vented one but for the demonstration just a face shield so that he could be heard - an excellent day thanks to John Wood our Secretary!